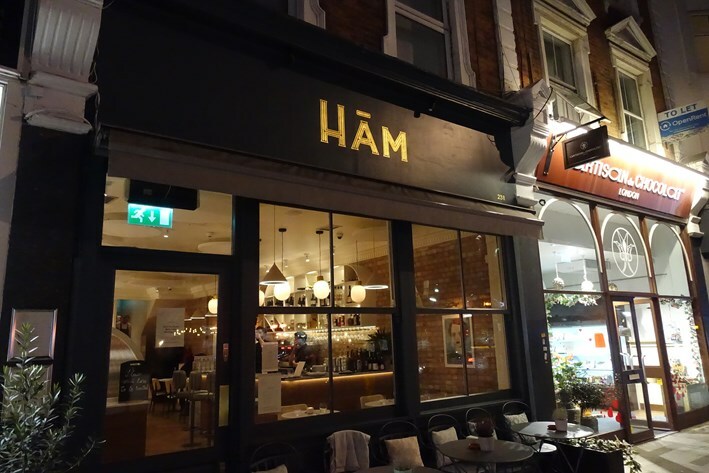 Hām, set in a terrace of shops in West Hampstead, opened in early 2018. The restaurant name is an old English word meaning “settlement” or “home”. Australian head chef Matt Osborne has worked at Terroirs and, further back in his career, at The Ledbury amongst other places. 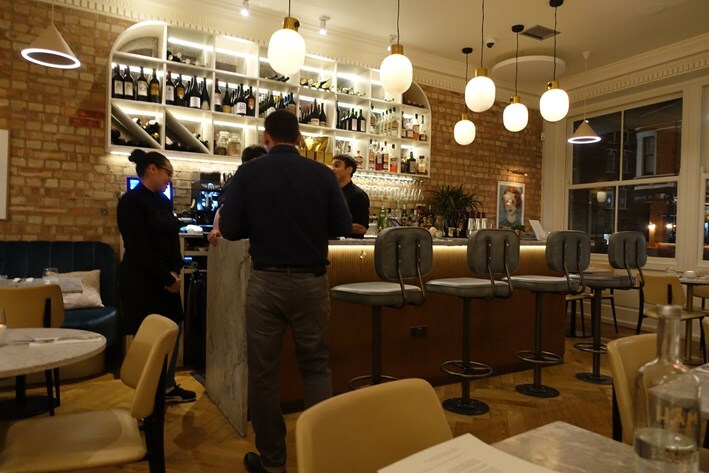 The menu is modern British, and the dining room informal, with no tablecloths and tightly packed tables. Lots of hard surfaces result in quite high noise levels, hitting 95 dB at peak on the busy evening of our visit as measured on my noise meter. The kitchen is up a flight of stairs and overlooks the dining room. The menu is, inevitably, “small plates sharing”, which appears to be the law these days for all new restaurants. The wine list had 37 labels and started at £19.50, with a median price of £46. Sample references were Good Hope Oceanside, Cabernet Sauvignon and Merlot 2016 at £28 for a bottle that you can find in the high street for £8, MA Arndorfer Grüner Veltliner Kamptal 2016 at £39 compared to its retail price of £19, and the excellent Chateau Musar 1998 at £66 for a wine that will set you back £42 in the high street, if you could actually find this rather old vintage. The average markup on the list was 2.6 times retail price, which is not bad at all by London standards. 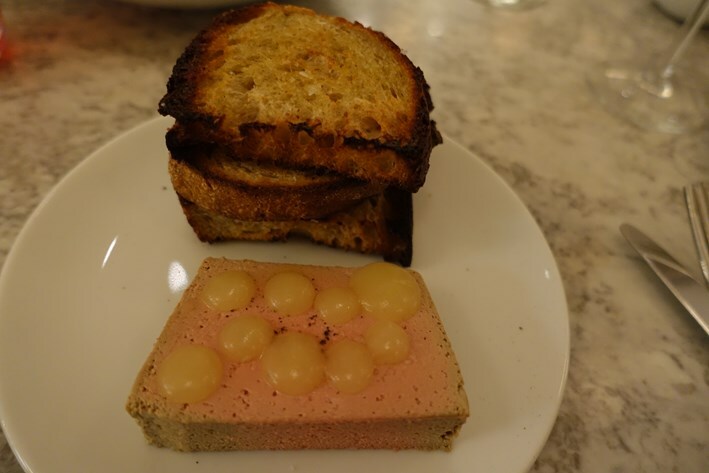 Chicken liver parfait came with good sourdough toast (supplied by Margot Bakery in East Finchley), the parfait quite smooth in texture and having plenty of liver flavour (14/20). A celeriac croquette with preserved lemon and cucumber had a crisp coating, the celeriac flavour coming through all right, though the texture of the vegetable filling was just a touch on the gooey side (13/20). Potato rosti with crab mayonnaise was very good indeed, the crab tasting fresh and the rosti being suitably crisp on the outside yet soft inside (14/20). 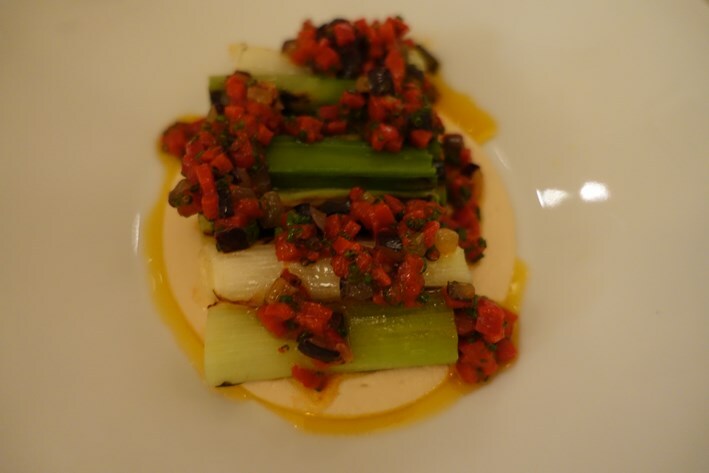 Barbecued Calcot onions with piquillo peppers, grapes and almond sauce was an interesting mix of flavours. 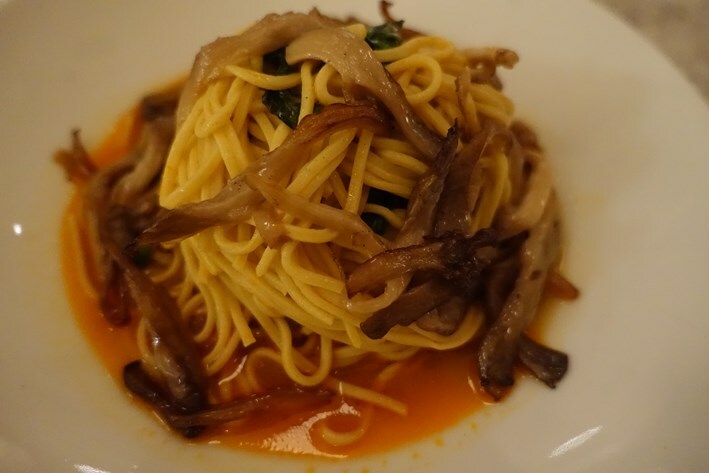 The onions had pleasant inherent sweetness and the acidity of the grapes provided freshness (13/20). 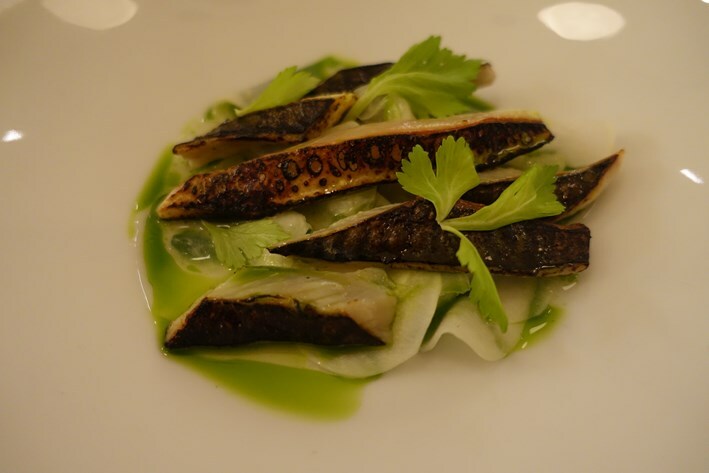 Torched mackerel came with kohlrabi, oyster sauce and lovage, the fish lightly cooked and having nice flavour, the accompaniments going quite well with the oiliness of the mackerel (13/20). A slab of brill was carefully cooked and had nice flavour, served on a bed of artichoke, kombu and freekeh, a cereal made from roasted durum wheat. The grain provided a pleasantly contrasting texture to the brill (14/20). Prawn broth with noodles and oyster mushrooms had an enjoyably spicy kick, the noodles having excellent texture and the mushrooms being carefully cooked (14/20). Herdwick lamb was tender, served with salsify, black garlic and yoghurt (14/20). 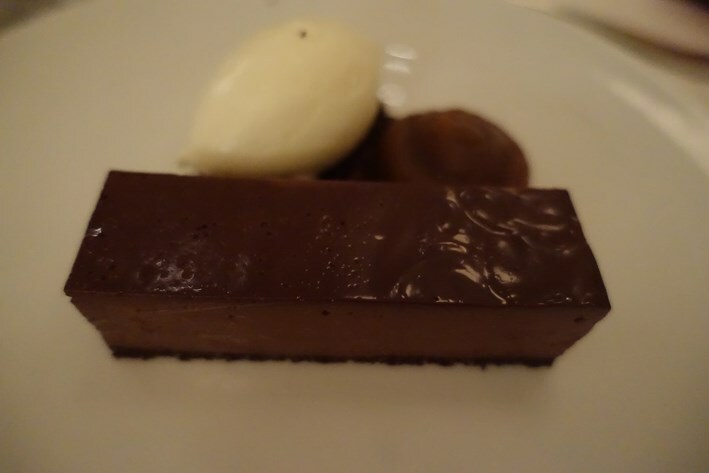 For dessert, a slice of chocolate tart with dates was suitably rich and worked well with yoghurt ice cream (14/20). Macadamia parfait was flavoured with blood orange and lemon thyme and came with mandarin sorbet. For me the lemon thyme was a little strong, but the sorbet had good texture (13/20). Better was rhubarb and ginger cake with almonds along with milk ice cream. 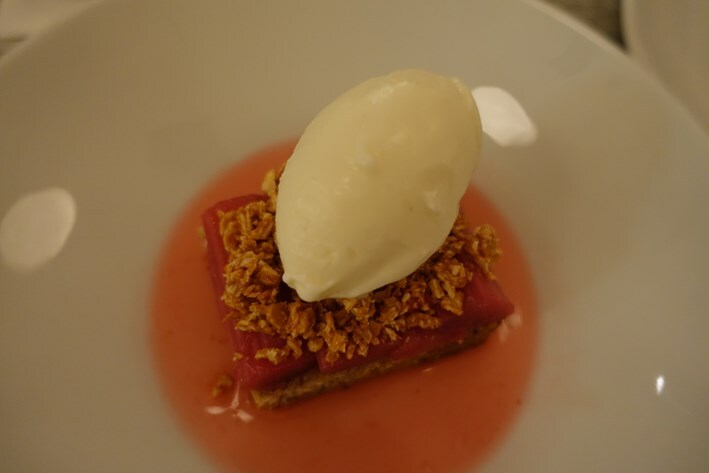 The natural sharpness of the rhubarb was a good foil for the milk ice cream, and the cake’s ginger flavour is a classic pairing for rhubarb (14/20). Coffee was from AllPress, a classy coffee brand that seemed almost ubiquitous in its home of Auckland when I visited there, and in London is based in Dalston. This is a very good coffee, and a choice that shows that the restaurant pays attention to the details. Service was fine, our Romanian waitress being friendly and helpful. The waiters did have a tendency to cluster around the bar and chat to each other rather than watching the room, but this is a fairly casual restaurant and everything worked well enough. The bill came to £79 per person, with cocktails and a bottle of Chateau Musar to drink. If you shared a modest bottle of wine then a typical cost per person might be around £60, which seems pretty fair to me. I liked Hām, with its friendly atmosphere and food that is better than I was expecting for such a neighborhood restaurant setting. West Hampstead is not overly blessed with good restaurants. The main local alternative is the long established Bradleys, and in truth the food is better here. This is the kind of restaurant we would all be pleased to have at the end of our road.